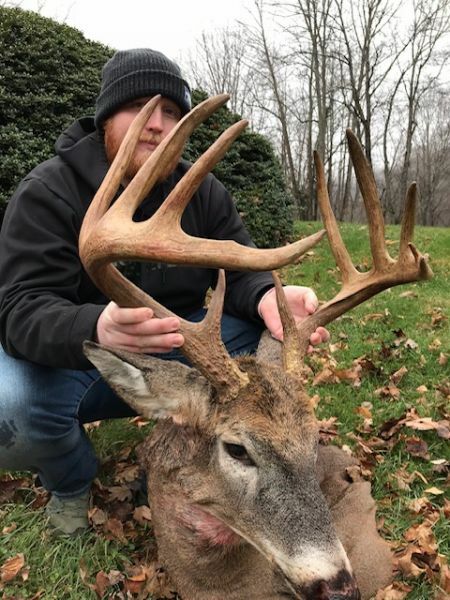 Huge buck goes down in Watauga County, N.C.
That’s what Chase McLean of Boone, N.C., thought about the 162-inch, 11-point buck he killed on Thanksgiving afternoon. He’d never seen the huge buck before, never gotten a trail-camera photo of it on the property he was hunting in the mountains of Watauga County, tucked in the northwestern corner of North Carolina, hard by Tennessee and Virginia. And when the buck passed his pop-up ground blind at 35 yards, it wasn’t wasting any time or hanging around — nose to the ground, mouth open, panting, chasing a doe. “He had to just be passing through,” McLean said. But the morning after he killed the buck — which carried a typical 5x6 rack with main beams almost 25 inches long, an 18 1/4-inch inside spread and tines measuring 10 1/2, 10 1/8, 9 and 8 3/4 inches — when he was skinning it, he found out that his uncle had an enormous shed antler from 2017, found in a Christmas tree patch about five miles away. Once he saw the shed, there was no question it came from the huge buck he killed with a lever-action Marlin .45-70 rifle with iron sights. “There is no question it came from the same deer,” he said. “The shed was his right-side antler, and it’s identical to his right-side antler. It was 5:10 on Thanksgiving afternoon when McLean saw a doe trotting through the woods, along a well-worn deer trail he had set up to watch. The buck was 20 yards behind, matching the doe step for step. “I saw him, and I knew he was big, but I didn’t have much time,” he said. At 35 yards, a quick shot high in the shoulder put the buck down on the spot. McLean never hung the buck from a set of scales but said it was easily heavier than 200 pounds — but maybe not the biggest animal he’s killed from his ground blind this season. “I shot a bear from the same blind on Nov. 5,” he said. “It came in from behind and stuck its head in one of the windows. I’ve had more bears than deer on my trail cameras. They love me; I must smell like a honey bun. The deer was the first that McLean has shot with his .45-70, a rifle he fell in love with after his father, Tracy McLean, bought one two years ago.